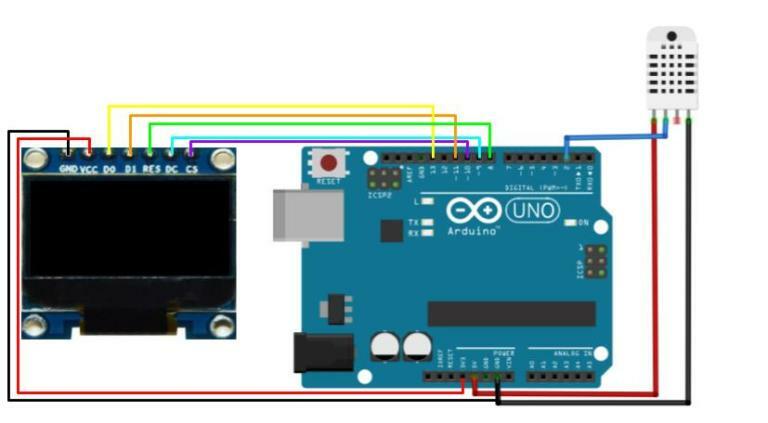 In this Tutorial, you are going to learn about Arduino OLED interfacing. 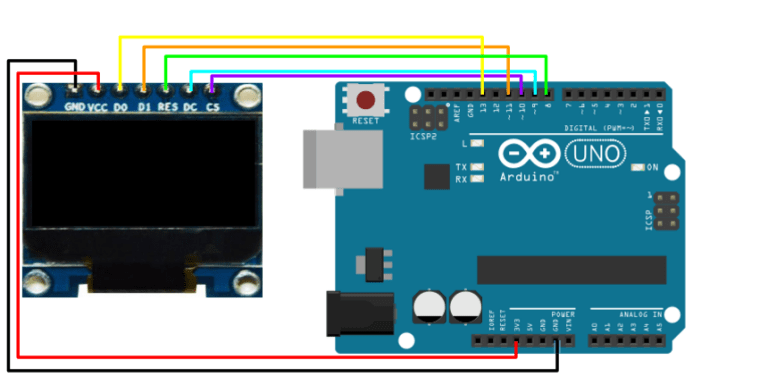 In this Tutorial, you are going to learn about Arduino OLED interfacing. In the first part, we will show the temperature and humidity sensor data on the OLED and in the second part, we will display the iPhone, Samsung and LG logo's on the OLED. 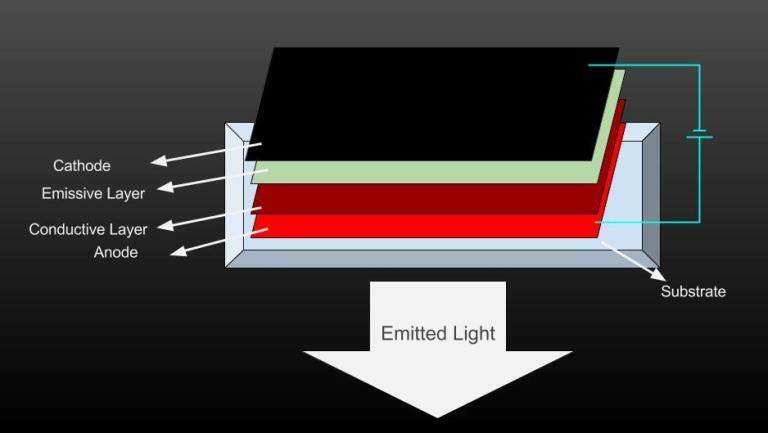 OLED stands for Organic Light Emitting Diode. The OLED displays are very small and have high resolution. These displays have no back light and they makes their own light. That’s why these are very low power devices. When the voltage is applied to the OLED. The current flows from the cathode to anode through the organic layers of the OLED. The cathode gives the electrons to the emissive layer of organic molecules and the anode removes electrons from the conductive layer of organic molecules. At the boundary between the conductive and emissive layer, electron holes are created. These holes are filled by the electrons and the OLED emits light. The color of the OLED depends upon the organic molecules used. The OLED that we are going to use has individual 128X64 white OLED pixels. It is 0.96’’ (25mm X 14mm) in size. The OLED’s of other sizes are also available. The OLED used in this tutorial is monochrome (Only one color) but you can also get the OLED’s having several colors. 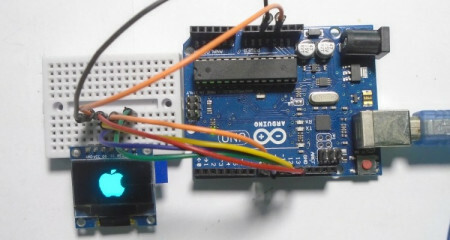 This OLED uses the SPI communication to communicate with Arduino. The SPI communication is faster than the I2C communication so this will make our display faster. 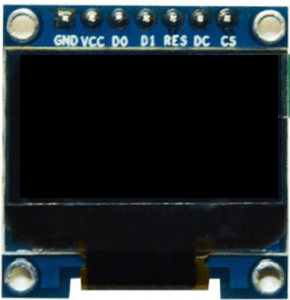 The OLED runs on 3.3V so do not connect it to 5V of Arduino. It may work but the lifetime of the OLED will decrease. For the OLED, we have used the U8glib library. Let’s see how the library is working. The data is printed on the OLED in the form of picture loops. The firstPage() shows the start of the picture loop. Next to it, we need to create the “do while” loop. Anything we want to show on the OLED should be written inside “do while” loop. The “do while” loop will keep on running until the nextpage() returns a ‘1’. The u8g.setFont(u8g_font_helvB10) command will set the font. This library has different font sizes and design which you can find from the below link. The u8g.drawStr(30, 10, “Welcome “) command will print the “welcome” at the X,Y position. The value ‘30’ is for the horizontal position(X) and the value ‘10’ is for the vertical position(Y). The other draw commands are also working like that. The u8g.setPrintPos(75, 15) command used in the code will set the pointer to X (75), Y (15) position. Then you can print the sensor output there by using the u8g.print() command. 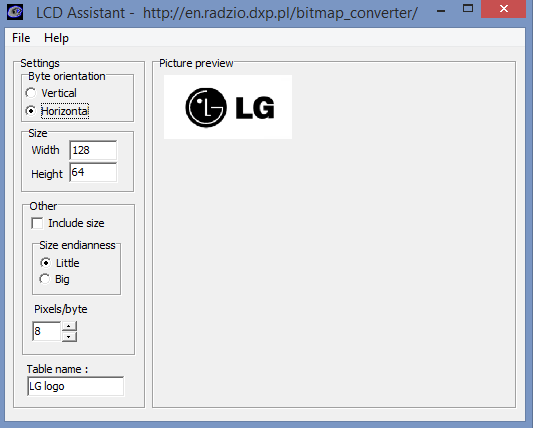 Now let’s draw the bitmap pictures on the OLED. We will draw the IPhone, Samsung and LG logos on the OLED. The circuit diagram for this example is shown below. The maximum size of picture to be drawn on the OLED should be 128X64 pixels and the picture should be black and white because our OLED is monochrome which means that it has only one color. If you have multiple color OLED, then you can display the color pictures. I downloaded the black and white logos and resized them in the paint tool. 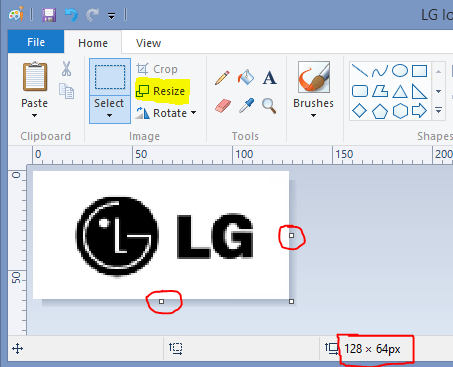 Paint has the resize option in the Home menu as highlighted with yellow color in below image. If resize option doesn’t do the work then you can also drag the drawing area from the small rectangles as circled in below image. You can download the bitmap pictures I used from below. Now open the file menu and click on save output. Save the file name with “.c” at the end like “logo.c”. Then open the saved file in the text editor and copy the code from there. This will be the code for creating the bitmap picture on the OLED. Then paste it in the Arduino code like I have done in the below code.